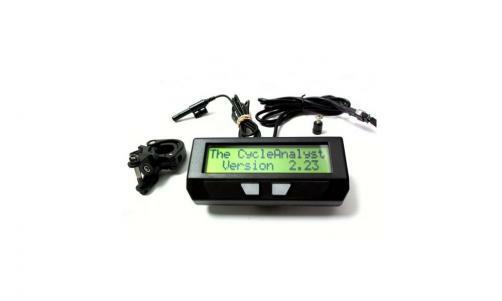 The CA-DPS is the Direct Plug-in with Speedo version of the Cycle Analyst, made by Grin Tech: This is a variation of the CA-DP device for ebike setups that can't use the hall signals in the motor controller for the speed sensing. This would include DC motor systems which don't have hall sensors, geared motor setups like the Mac kits where the motor RPM does not match the wheel RPM, and mid-drive arrangements where the motor powers through the bicycle drive chain. It uses a separate speedometer sensor and spoke magnet to measure wheel speed directly from the wheel. All EM3ev Infineon Controllers are fitted with CA plug as standard and the controller shunt value is measured and written on the case for easy CA configuration. • Volts, Watts, Amps: The instantaneous electric power being drawn from the battery. • Amp-Hours, Watt Hours: The net energy that has been pulled from the pack since the meter was reset. The accumulated amp-hours let you know the remaining energy in the battery pack with far greater accuracy than a voltage or LED indicator. • Speed, Distance, Time: All of the basic features of a bicycle computer, including the average and maximum trip speeds, plus a total distance odometer. • Regen, Wh/km: There are several quantities this meter will calculate that you don't get with other instrumentation, such as the % extra range that was gained from regenerative braking, as well as the vehicle's average energy use in Watt-hours per kilometer or mile. • Peak Currents and Voltage Sag: Records the maximum forwards and regenerative currents as well as the minimum voltage on the battery pack. • Total Battery Cycles and Amp-Hours: Retains life cycle information on the vehicle's battery pack, such as how many charge and discharge cycles the pack has experienced and the total amp-hours that were delivered over its entire life. Furthermore, the Cycle Analyst has the ability to over-ride the user's throttle and regulate the power delivered to the motor, turning an otherwise dumb ebike into an intelligent device with a user programmable speed limit, current limit, and low voltage cutout. • Speed Limit: This has the utility of providing legal compliance to the speed cap imposed on ebikes in most jurisdictions. When used with a full throttle, it serves as a cruise control on the electric bicycle. It can also be beneficial to riders who want to increase their torque and power by using a higher voltage battery, without simultaneously increasing their top-end speed. • Current Limit: An adjustable amps limit is useful to prevent damage to the batteries from excessive current draw, to increase the range that you'll get on a charge, and to protect the motor controller and motor in setups that draws too many amps. • Voltage Cutout: A low voltage cutout is used to protect a battery pack from being discharged too deeply, which can cause cell reversals in NiMH/NiCad packs, permanent cell damage in Lithium packs, and sulfation in Lead Acid batteries. The programmable low voltage rollback allows you to set an appropriate low voltage point tailored to your pack. • Remote Shunt: Unlike the watt-meters and amp-hour meters designed for RC hobbyists, the Cycle Analyst uses a remote shunt for sensing current rather than running wire through the meter, so you do not need to route heavy gauge battery cables up to the handlebar and back. • Backlit LCD: The display readout is well illuminated for night riding. • Water Resistant: The circuitry is fully enclosed in a sealed box enabling it to withstand exposure to wet and rainy conditions. • Handlebar Mounting: Easily attaches to handlebar tubes from 7/8" to 1 ¼" diameter with included hardware. • Save on Power Down: Trip data such as amp-hours and distance are saved when the meter is shut off, and are restored when power is re-applied. • Fwd and Negative Amps: Both positive and negative amp-hours are displayed separately, so you can calculate accurate regenerative braking statistics or use it to monitor charging currents as well. • Wide Voltage Range: Operates from 10V to 150V, accommodating the vast majority of all small electric vehicles. A high voltage option for use up to 350V is available on special request. 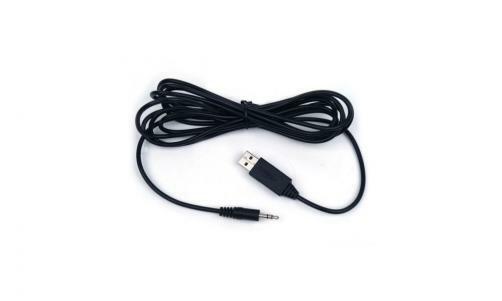 • Flexible Speed Input: Detects vehicle speed either with a magnet and sensor cable or through the hall effect signal on brushless motor controllers. • Data Logging: Devices have a serial output stream that can be used for real-time recording the vehicle statistics to a computer or laptop.